In any vacuum system it is most important to know accurately the level of vacuum on real time basis as even a minor change in vacuum can result in process parameters going haywire and product quality getting adversely affected. In modern day vacuum systems we use sophisticated vacuum gauges to know the vacuum accurately. In this blog post various kinds of vacuum gauges have been described. 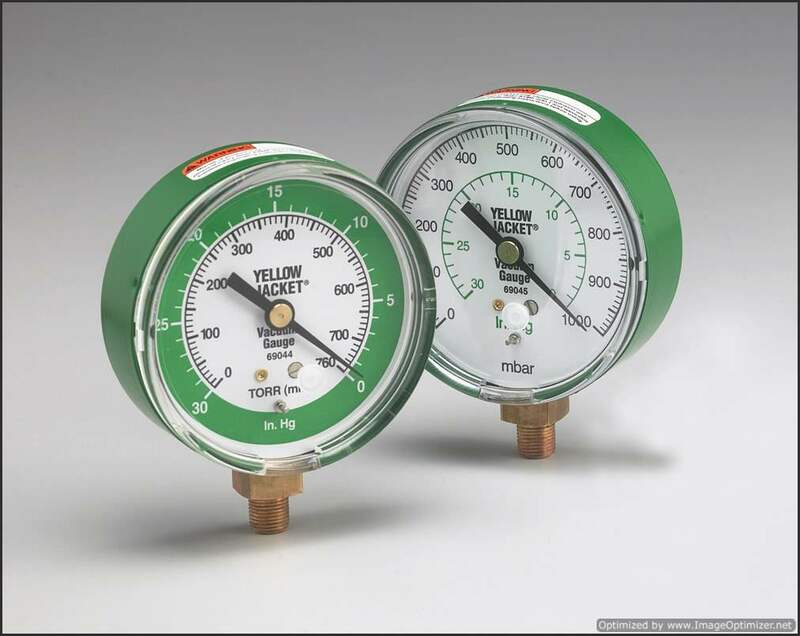 Limitations and advantages of these gauges have also been brought out so that engineers using vacuum can select appropriate gauge for the application. Various practical aspects about use of vacuum gauges have also been detailed in this blog post. 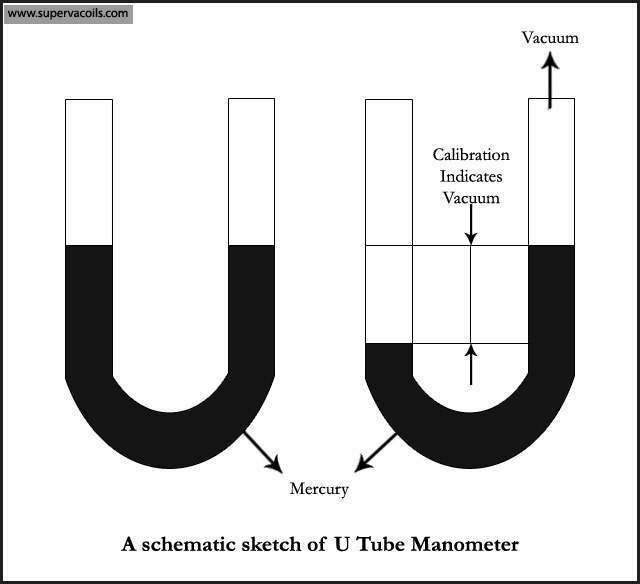 U Tube Manometer: – This is the most basic vacuum gauge where height of liquid column of mercury is used to measure vacuum. Advantage– It is very simple, inexpensive and independent of system gas. Disadvantage– this gauge can measure vacuum only up to 1 Torr. 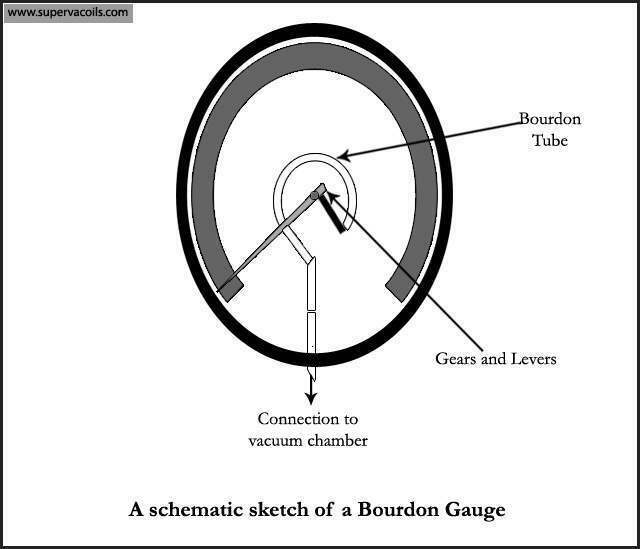 Bourdon Gauge:- Quite effective for measuring low vacuum, this gauge uses a curved metal tube which is closed on one side and connected to vacuum on other side. Depending on the vacuum level the tube called Bourdon Tube distorts. This distortion is amplified by gears and levers and this indicates vacuum level on the gauge dial. Advantage– It is simple, inexpensive and independent of system gas. Disadvantage– It can measure vacuum only up to 1 Torr. 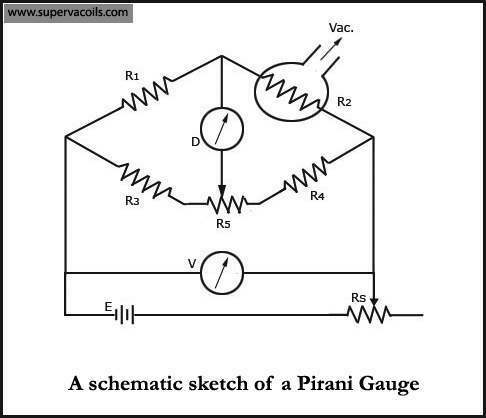 Pirani Gauge:- Quite widely used gauge to measure moderate vacuum up to 10-3 In these gauges current is used to heat a wire. This heated wire continuously loses heat. Rate of loss of heat is dependent on the pressure around it. If pressure around it is low (High vacuum) then loss of heat will be lower. The wire temperature in turn changes its resistance. The change in resistance which indicates level of vacuum is measured as the heated wire is a part of the bridge circuit. Advantage– It is a simple and effective gauge which is quite sensitive. Disadvantage– This gauge is dependent on gas in the system and cannot measure high vacuum. 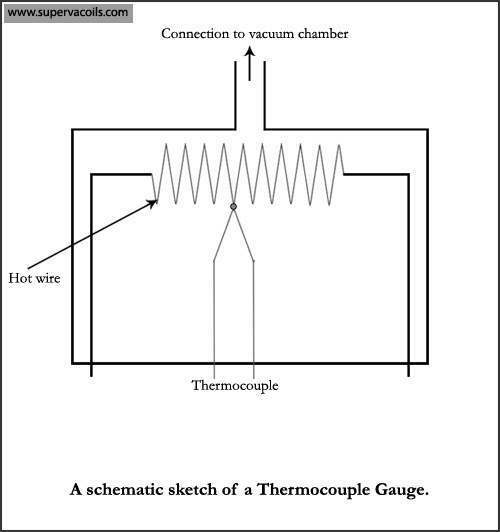 Thermocouple Gauge:- This gauge is very similar to Pirani Gauge except that in a thermocouple gauge a thermocouple is spot welded directly to heated wire so a direct temperature measurement is taken which is converted into measurement of vacuum. Advantage and disadvantages of this gauge are same as that of Pirani Gauge. 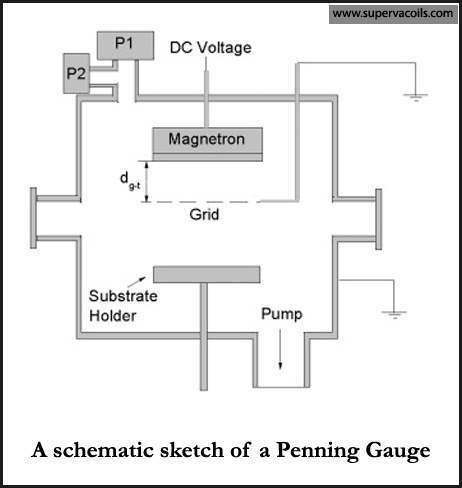 Penning Gauge:- This gauge is named after its inventor. In this gauge, current produced by glow discharge is used to measure vacuum. A high potential difference is applied to produce a self-sustaining glow. Around the glow a magnetic field is applied. The current produced is dependent on the vacuum level and therefore measurement of glow current indicates vacuum level. Advantage– It can measure vacuum up to 10-6 Torr accurately. Disadvantage– This gauge cannot measure vacuum till vacuum is at least 10-3 Torr since glow cannot be sustained below this vacuum. 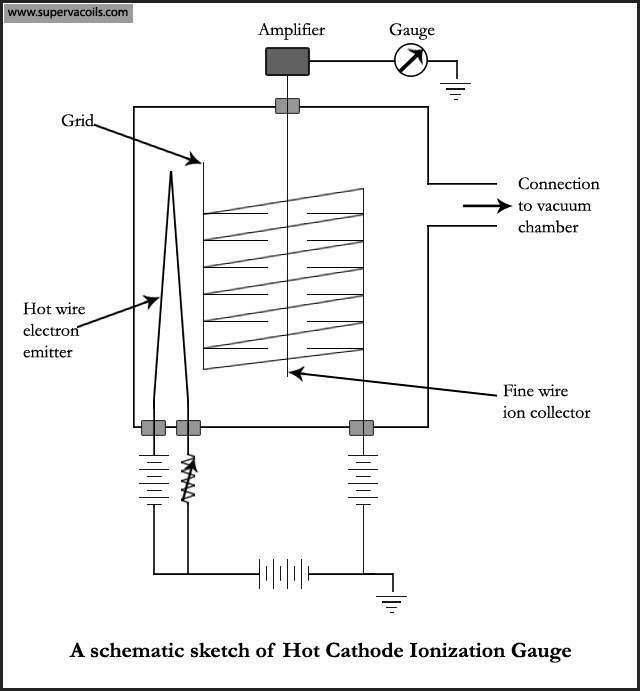 Hot Cathode Ionization Gauge:- This is also called an Ion Gauge. In this gauge a hot wire is used to produce electrons by thermionic emission. The electrons thus produced are attracted to anode which is in the form a grid. The Ion current obviously will depend on the vacuum level. Measurement of the current therefore indicates level of vacuum. Advantage– This gauge can accurately measure vacuum up to 10-7 Torr. Since this gauge is not dependent on glow discharge so it can measure small vacuum also. Disadvantage– It requires frequent maintenance. Hot wire filament can get damaged if proper vacuum level has not been reached and gauge is switched on. In order to get accurate reading of vacuum many precautions have been listed below which are based on experience. Position of the gauge is very important for accurate reading. For example- If a gauge is positioned in line with gas input it is bound to give a false high reading. Using good quality vacuum pump oils like High Vacuum Silicone Diffusion Pump Oil: SV-SIGMA and Triple Molecular Synthetic Rotary Pump Oil: SV-77 helps extend life of vacuum gauges as well as reduces the requirement of maintenance in vacuum system. Gauge should, as far as possible, be in the center of vacuum chamber. A gauge at a far corner will not respond quickly to change of vacuum. Proper maintenance of gauge which is primarily cleaning of ‘Head’ must be periodically done to get accurate reading and long life of gauges. Keeping a few spare gauges helps a lot. Before going for a vacuum leak-hunting sometimes change of gauge itself solves the problem. Vacuum gauge should always be tightly screwed to vacuum line. Also high vacuum silicone grease like SV-G9 High Vacuum Silicone Grease should be used at the junction of vacuum gauge and vacuum line. This helps prevent any leakage at the junction. To facilitate leakage hunting, vacuum system must have many gauges at different locations of the system so that isolation and vacuum checking becomes easier. Gauges are most important part of vacuum system. If engineers choose the correct gauge for specific application (as described above) and follow practical guidelines then this can go a long way in saving production time which otherwise would be wasted in false leakage hunting. Accuracy of the gauges will also ensure proper product quality and enhancement of the life of vacuum system.